Lighter, sportier and with the return of hybrid powetrains, the 2020 Ford Escape is all grown up. Last week, Ford teased the upcoming 2020 Escape crossover, revealing a few closeup shots of the grille and tail lights. Thankfully, we were invited to Detroit to get a closer look at the new vehicle, which the company says is its most advanced, most flexible, and best-performing Escape ever. The Escape will ride on a brand-new platform that is shared with the upcoming Lincoln Corsair crossover, and has been put on a weight loss plan, down 200 pounds from the outgoing model. It’s also longer, wider and lower. The grille shape is similar to the sixth-gen Mustang and the lower front end borrows from Ford’s supercar, the GT. Suspension and aerodynamics have been improved for the new model, which should help liven up the driving experience. Four new powertrains will make their way under the Escape’s hood for 2020. Escape S, SE and SEL trims will get a 1.5-liter EcoBoost three-cylinder that has 180 horsepower and 177 pound-feet of torque. A 2.0-liter EcoBoost four-cylinder will be available for Titanium models rated at 250 hp and 275 lb-ft of torque. Ford says the larger EcoBoost will deliver a 0-60 mph time that is 10 percent faster than the outgoing 2.0-liter and a tow rating of 3,500 pounds when the Escape is optioned with the right packages. Both gas engines will be mated to an 8-speed automatic transmission with available sport shifting for models with the 2.0-liter engine. Two hybrid powertrains are coming to the lineup for the first time since 2012. SE Sport and Titanium models will come standard with a 2.5-liter Atkinson cycle hybrid engine paired with a CVT. 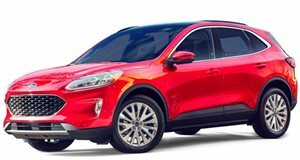 Front-wheel drive hybrid Escape models are expected to see 198 combined system horsepower and an 85-mph electric-only top speed. All other trims are available with a plug-in hybrid package that uses the same 2.5-liter engine, capable of 30 miles of electric-only range. The batteries in hybrid Escape models will be tucked under the rear seat, which both centers the extra weight between the axles and keeps the cargo area free from intrusions. Gas-powered Escapes are expected to reach at least 400 miles per tank and hybrid models will target 550 miles of total range. Big changes are coming for the Escape’s technology as well. All models will come with FordPass Connect, which gives owners the ability to locate, start and lock/unlock their Escapes from a connected smartphone. A 4G LTE hotspot is also standard and has support for up to ten devices. Most Escape models will come with an 8-inch touchscreen and a 12-inch digital gauge cluster display will be available. Ford’s Co-Pilot360 safety technology will be standard for all trim levels, which includes features like adaptive cruise control, automatic emergency braking and blind spot monitors. We don’t yet know pricing for the new Escape but should have more details as we get closer to seeing it on dealer lots this fall. Plug-in hybrid models won’t be available until spring of 2020.